There have been several studies and articles citing the negative health effects of sitting at a desk for 40+ hours per week. Quite honestly, we can take a peek back even further to realize we have been sitting at desks, all day, since kindergarten. Between school, workstations, cars, couches and kitchen chairs, we are all spending too much time in the same alignment with little variation. Muscles and joints shorten to adapt to these positions. There is less blood flow. There is no doubt an increase in the rates of diabetes, heart conditions, metabolic disease and spinal pain. But can it be blamed only on sitting? Or is there a bigger concern? As a PT, I can agree that we need to sit less overall but what I see as being the biggest contributor (outside of nutrition) to the decline in our health is the fact that we all need to move more. (Full disclosure is that I was sitting, reclined in my chair, with my laptop actually on my lap at the start of this blog. And then I moved). I have suggested ‘optimal’ ergonomics for my clients’ workstations for 10+ years. But fancy chairs and desks will not be able to replace our bodies innate need to move more. And a solution I can’t agree with is the popular idea to move everyone to a standing desk. While standing is certainly better, It is still not ideal to sustain ANY static postures (static = non-movement). So the problem with the standing trend is that we are just replacing one static posture for another! Movement is essential to improving the current state of our health (or rather our un-health). People who are ‘on board’ to improve their health get themselves to the gym for 1 hour/day. Although movement is good, the concern I have with this is that we cannot expect 1 hour of intense exercise to counter the negative side effects of otherwise being stagnant for 23 hours/day (I might be exaggerating, but only slightly). We have a extensive lack of movement in our lives when we consider how we commute to work, sit to eat, sit to watch TV/play on the computer, sit to read, sit to socialize and lying still while sleeping. Honestly we don’t move enough. So, would 2 hours of exercise be enough? Maybe 3? I can’t find that kind of time. I am encouraging my clients (and myself!) to move more throughout the day. In current culture we are encouraged to “work smarter, not harder”. But, I would counter that we need to sometimes work harder, to get little bits of blood flow, joint loading, muscle stretch and strength organically throughout our day. It’s as simple as taking the stairs, parking a bit further away, stretching while chatting with friends/co-workers, and even sitting but with variations in position. My friend asked the other day “how can you sit on the floor like that?” Because I do it. Regularly. And that’s how my joints and muscles will continue to know how to do it. A dynamic work station is a good start to adding more movement to your work day. This means having the ability to change positions often, quite possibly every 30 minutes or less. 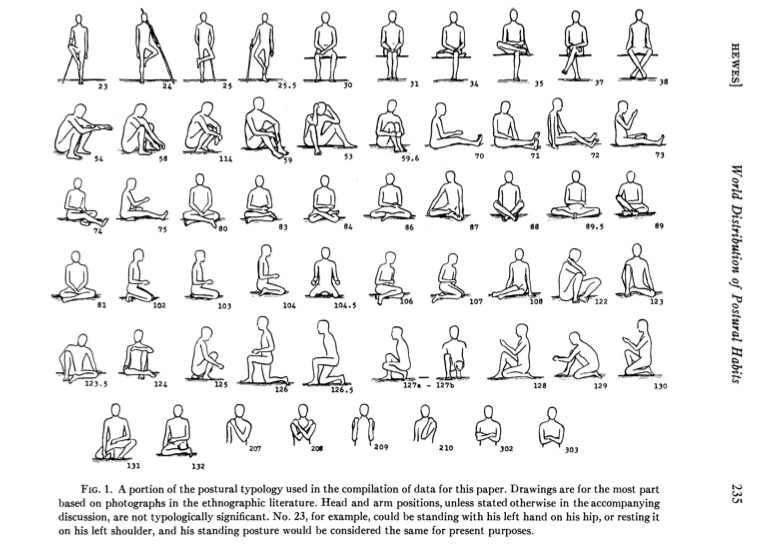 It means sitting across various surfaces which changes the angles on our joints and demands on our muscles. It means standing a bit, maybe to stretch our spine, chest, calves or quads while we are on the phone. It means taking a few quick laps around the office while we take screen breaks. It may even mean doing a few deep squats to release even further. What about having our meetings while walking (2 birds with one stone. Seriously). This would mean changing the typical work culture as we currently know it. Please read “Don’t Just Sit There” by Katie Bowman if you want more easy-to-implement ideas and a read which certainly inspired this blog post!